The greenest of green teas, our authentic Gyokuro is grown outside the old imperial capital of Kyoto in Uji, where special bushes are covered for three to four weeks prior to harvest in order to intensify their natural color and distinctive umami flavor. After plucking, the shade-grown leaves are steamed, rolled and dried, then vacuum-packed and shipped by air to preserve them at the peak of freshness for a cup that's sweet, smooth and uniquely full-bodied. One taste reveals why, in Japanese, Gyokuro means jade dew. -PREPARATION: The most delicate of all teas, Gyokuro is best prepared in a small, pre-warmed teapot and infused with water heated to approx. 122°F (50°C) for 4 minutes. Serve in pre-warmed cups. To reinfuse, use slightly hotter water and infuse for about a minute. 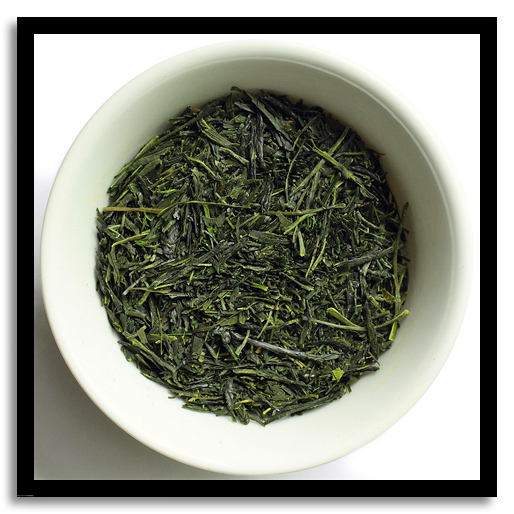 Sencha's deep green color and distinctively rich, grassy flavor with floral overtones result from steaming and rolling the freshly-picked leaves - a process invented in Uji in the 18th century. (Steaming denatures enzymes that would otherwise oxidize and cause the leaves to darken, as in Chinese oolong and black teas.) Our premium Sencha is manufactured and vacuum-packed in Uji, then air-shipped out of Osaka, so it's guaranteed fresh, delicious & healthful. Please note instructions below to get the best out of every cup. PREPARATION: Preheat the pot with hot water and infuse the leaves for about 1 minute with less-than-boiling water [approx. 158°F (70°C)] to avoid over-steeping, and serve in pre-warmed cups. To reinfuse, use slightly hotter water and infuse for about 30 seconds.